Fooled another big old doe on Christmas Eve. About 12 yard shot with my 'Curly Ash' Pronghorn. Nice! That doe looks huge. 4 hunts left before Saturday for me. 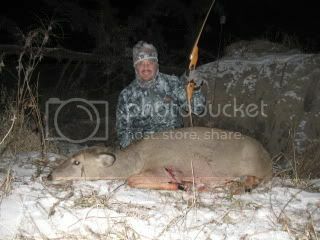 Congrats everyone - some very nice animals taken with true archery gear! I ended my season a couple of weeks ago after taking a nice 5x4 with my osage selfbow. While I still have a doe tag, I think I'll start carving out another bow instead. Good luck on the rest of the season to those of you still hunting!